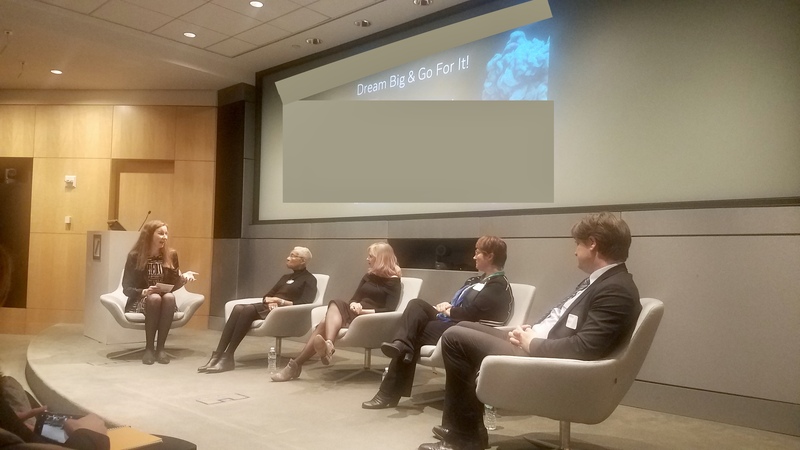 As a huge fan of ‘Dream, Girl’, I was absolutely thrilled to not only spend the evening with Erin and Clara at the film screening, but also moderate a panel discussion with Erin, Clara, and 2 senior leaders in the financial services industry. This definitely felt like one of my dreams coming true! We talked about how the audience can bring entrepreneurial thinking into their lives and corporations, and how they can dream big & go for it. The panelists have been an absolute inspiration for me personally and everyone in the audience. That night, 120 women left the room fully charged and inspired, ready to dream big. Any new big dream you have, get it out of your head and start making it real. Think about: What 5 concrete action steps can you take right now to move your dream forward? Write them down and then think about the people in your network. Who can help you make this happen? “It’s ok to feel scared if you start something new, it doesn’t mean you don’t do it”. Remind yourself of your motivation: What’s your big ‘why’ that’s driving you? Also, think about new habits and skills. What do you need to learn that’s going to help you accomplish your dream? In order to dream big, self-care is really important. Take time out of your busy schedule to self-reflect, for instance, do a morning meditation. Think about: What practices can you implement on a regular basis? And note them on your calendar. Finally, put a big smile on your face and imagine: If your big dream had the power to change the world…. My favorite quote from the film is around Role Models: “If we don’t have role models and we’re not out there being the face of it, then we aren’t going to have any role models”.